When we first met Nikia, the German Shepherd, she was around 6 months old. Like many young dogs her age she was quickly growing out of the cute puppy phase and entering into the obnoxious teenage dog phase. Like many dogs Nikia’s age (especially those of working breeds like German Shepherd), she had reached the point where her high energy level combined with her lack of manners and obedience were starting to cause issues in the home. One of Nikia’s owners still suffers with pain and back issues from a car accident years ago. Nikia’s constant pulling on leash was putting her owner at risk of falling, especially with all the snow and ice we received this winter. Nikia also had a bad habit of jumping on guests, not coming when called, and in general not listening to directions from her owner. So after setting up an evaluation and hearing about our training programs they decided to jump right into a board and train for Nikia. 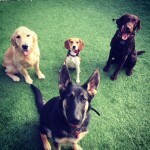 With our board and train program Nikia stayed with us for a few weeks while we laid a strong foundation of obedience. When Nikia first arrived for training we got to work teaching her obedience commands such as coming when called, sit stays, downs stays, place commands, heel, as well working on manners such as waiting at doorways, not jumping on guests, how to properly interact and play with other dogs. Nikia went on multiple field trips to pet store, parks, hardware stores, etc. to proof her training out in public. Slowly but sure Nikia changed from a wild, out of control puppy to a polite, respectful young dog. Prior to Nikia returning home we held 2 training lessons with her owners to show them what she learned and to teach them how to maintain her training once she returned home. 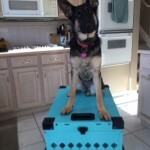 Now with Nikia’s strong training foundation and the tools we gave her owners, they have everything they need to continue on with her success. Below is video that shows Nikia from the day she arrived at our place for her Board and Train until she returned home.